A groundbreaking concept for a fusion reactor called the “dynomak” could reduce our carbon footprint and change the energy game — all on a budget — courtesy of graduate student Derek Sutherland. Thanks to fusion energy research conducted by University scientists and students under the direction of UW professor Thomas Jarboe, the drawbacks of coal-powered energy might soon be things of the past. That means saying goodbye to greenhouse gas emissions, hazardous waste, a limited supply of fuel and the outrageous cost of coal — just to name a few. 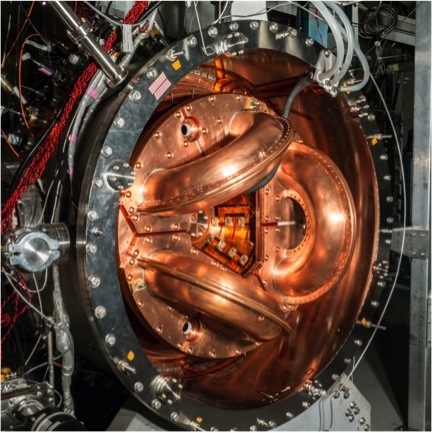 The UW’s current fusion experiment, HIT-SI3. Derek Sutherland always knew he wanted to be a scientist, but his choice as a senior in high school is perhaps a bit unusual: Plasma physics and fusion energy. After graduating from high school, Derek pursued nuclear fusion energy research, earning his bachelor’s of science from the Massachusetts Institute of Technology in 2012. He came to the UW shortly after, drawn in by the fusion work of Thomas Jarboe in aeronautics and astronautics. He’s working on his doctorate now and wants to find a way to make fusion energy viable to one day replace fossil fuels. With fusion physics, sometimes you get something in the lab that just looks like magic. It’s so foreign from what you’re used to in your everyday life, that when you see something, you think, how on Earth is that happening? Then you understand it scientifically and it starts to make sense. Derek loves the Pacific Northwest, especially the hiking, sailing and rowing the region has to offer. He enjoys traveling, particularly road trips and has been a violinist for more than a decade.